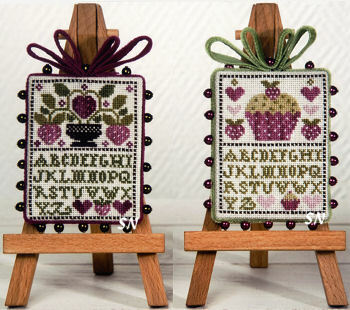 This is a small collection of whimsical designs that comes to us from France. Something about them is endearing... all the skinny legs, all the big berries and flowers... the scalloped borders... I just love 'em! 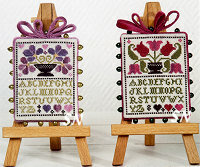 Offered in chart format, the instructions are written in French, with those recognizable DMC floss color numbers! I believe most of them call for overdyed floss dyed by Tra La La. Bits of Spring? Lots of rabbits and sheep in this one, there are 9 'sections' to this that would all make cute little cushions - another option instead of stitching the entire 9-1/2 x 12 inch piece. 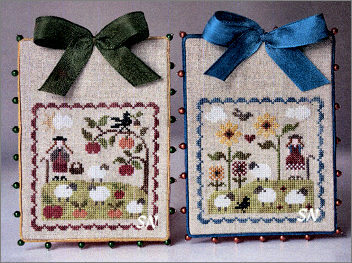 Pull out your stash of hand-dyed floss and choose your colors as this is charted for hand-dyeds sold in Italy. 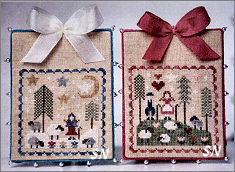 We have a 6-chart set of 4 x 4 monthly shepherdess squares by French Designer Tra La La. 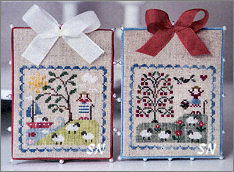 Really a cute set, each one is a shepherdess/farm girl tending her sheep. Her outfits change (she has on a striped bathing suit in June and a little witch hat in October) as well as the landscape, vegetation and little garden critters. 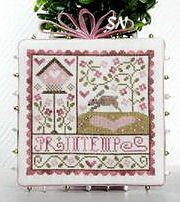 We've shown all 12 months here... float your mouse over the images to confirm which months they are. 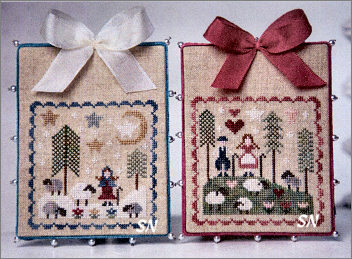 Stitch counts for all are 61 x 61, so adjusting your fabric size will change finished size. Presented as 6 charts, 2 months each, we have bundled all 6 together as one set. Truthfully. I am afraid I will not be able to keep up with 'pieces and parts and missing months', and I know everyone will want complete sets... so complete sets it is! Charted for DMC, these are pretty straightforward! This is a pretty urn of flowers -- a profusion of soft colors and charm. Measuring 88 x 89 in stitch count, it will finish approx 5-1/2 inches on 32ct. 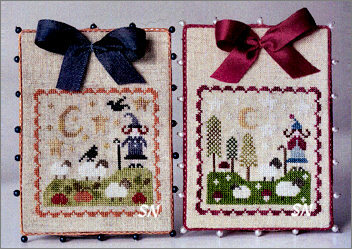 It is charted for both DMC and Gentle Art Sampler Threads -- the hand-dyeds were used in the stitched model pic. 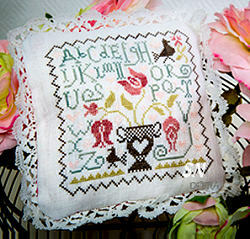 It'd make a lovely pillow for a sunny window seat, or a colorful pin cushion stitched on something small. Offered as a chart. 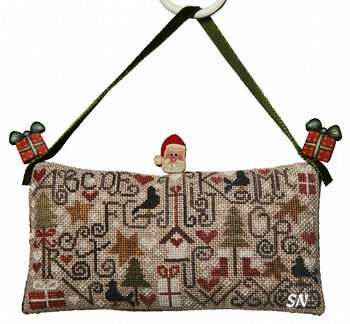 By Tra La La, this is a fun little Christmas piece that can be stitched together in its long row, or broken apart into single mice and trees. 4 Different mice and three different trees, the wrapped presents add some straight lines to this... but don't miss the tiny red-spotted mushrooms!!!!! 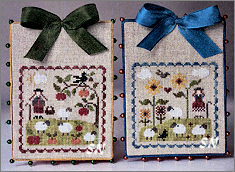 Stitch count on this is 191 x 81. You are on your own for color and fabric choices, and it might be fun to add Wisper or some other fuzzy thread to those mice!! Lots of options here! 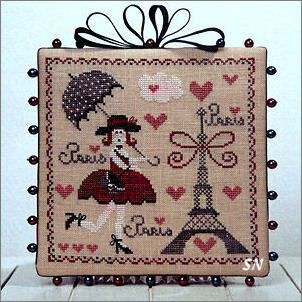 Charts by Tra La La... some cute designs for you Paris-Lovers! 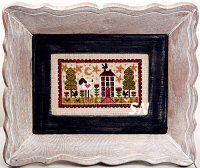 Stitch the Little Black Dress piece to decorate your closet door or inside wall -- if you have a big closet! Might be cute in the Laundry room too!!! 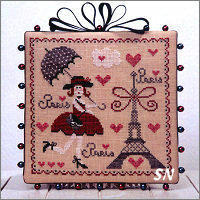 La Parisenne is sweet and would make a cute photo-album cover. 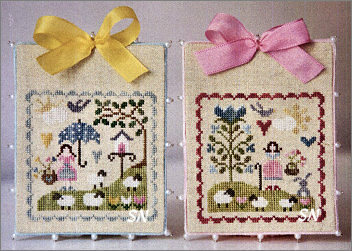 Just fun designs about 100 stitches square each... offered in chart format and coded for DMC and Gentle Art Sampler Threads. 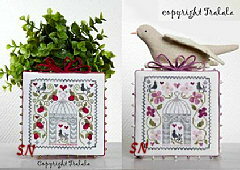 What a pretty, wild tulip basket -- a flowing vine along with a couple of hungry blackbirds! 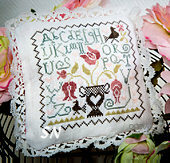 From Tra La La, this is one of three new designs we have. 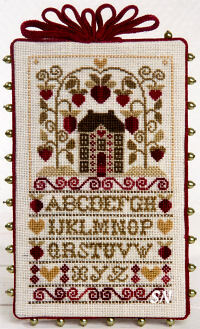 I love the curves in this -- it measures 92 x 100 in size and is shown in summery colors. 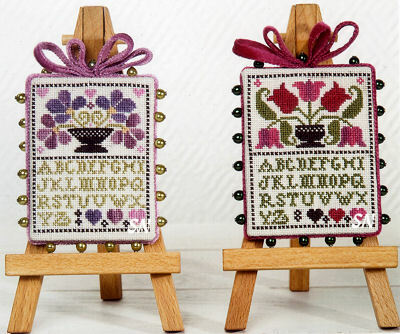 Picture it with those same black birds and rusty flowers with a golden alphabet... the shape of the design is really good, you can fit it to lots of color schemes. Directly from France... the chart is coded for DMC and Sampler Threads. That's all I can read -- but it's enough! 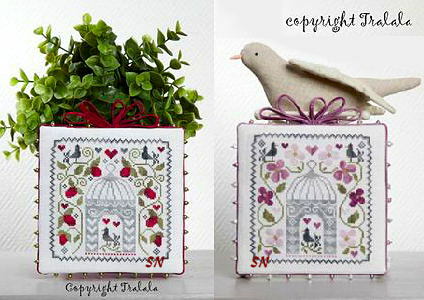 Make sure to see our other new offerings by Tra La La! CUTE! 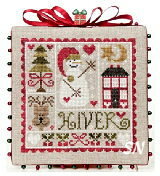 With a stitch count of 65 x 131 -- you can stitch this on any count fabric you want -- go over one or two threads. The chart calls for Gentle Art Sampler Threads, and I think the whole piece would love to be embellished with buttons and possibly a few glistening beads in the snowlfakes??? Offered as the chart, over one on 28ct, it would finish approx 2-1/4 x 4-1/2! 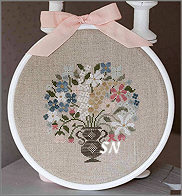 What a pretty urn with the explosion of flowers -- such a classic sampler-motif type of piece. 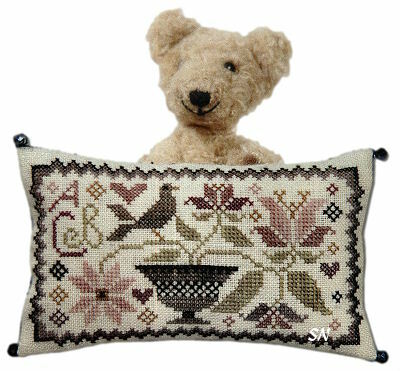 This needs to be made into a pin cushion stuffed with crushed walnut shells - so it feels soft and heavy. 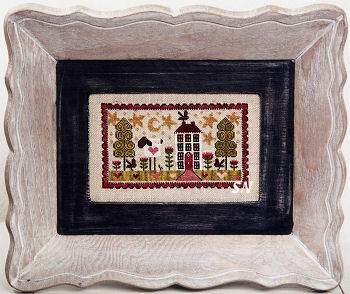 A stitch count of 49 x 85 offers a petite design that is worked in Gentle Art Sampler Threads of Briar Rose, Heirloom Gold, Dried Thyme, Old Red Paint, Old Purple Paint and DMC 3371. Spring and Summer? Don't know... but I like the gazebo surrounded with the lavish garden blooms of flowers and strawberries! 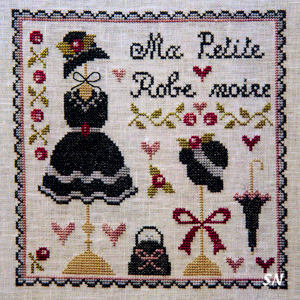 85 x 89 inch stitch count, charted in DMC! I'm sure this must say *Spring* on it... I love that little bunny section! 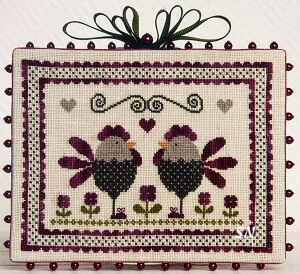 85 x 87 Stitch count, it uses 3722, 3781, 778, 3012, 646 and 3051. Pretty colors! Season of Winter? I think the snowman, tree and reindeer would all make cute Christmas ornaments -- especially over one, and finished with a ruched ribbon edge treatment. 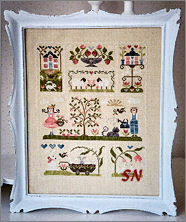 Stitch count of 129 x 75... such a charming sheep amidst a charming garden! 149 x 116... 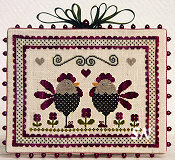 Deep greens and cranberries... so cute! 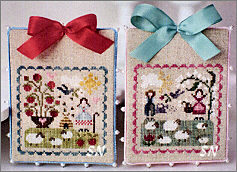 Two flower basket designs... they measure only 53 x 69, and can be stitched over one. Isn't that pin-finishing cute on them? Garden of Summer! Wouldn't you love to have strawberries growing like that in your garden? 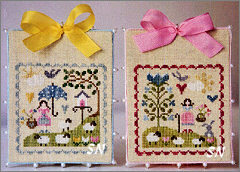 Stitch count of 85 x 148, it is a companion to the Spring Garden piece. 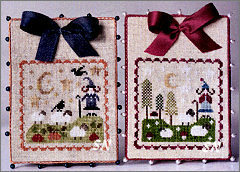 Another pair of small samplers, these both measure 53 x 69... models are worked over one on 32ct Platinum Belfast. Another one I cannot pronounce! 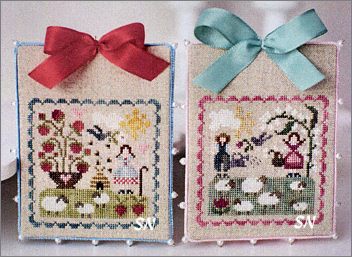 I think it's Garden of Spring... because it is a companion to Garden of Summer! 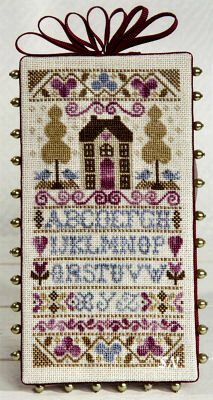 A 79 x 149 stitch count... everything about this is charming!! !